It will be available in Western Europe exclusively as a hybrid. The Avensis never really made a name for itself in Europe’s crowded midsize segment, being overshadowed by far more popular models such as the Opel/Vauxhall Insignia, Skoda Superb, Ford Mondeo, and of course – the Volkswagen Passat. Toyota is now attempting to recover lost ground by reintroducing the Camry in Western Europe after an absence of 14 years. Based on the eighth generation of the D/E-sedan, the 2019 Camry in European specification has a much more interesting design inside and out compared to the defunct Avensis. On the old continent, it’s going to be offered exclusively with a hybrid powertrain featuring an electrified 2.5-liter engine producing a more than decent 215 horsepower. ⠀ 2018 Toyota Camry | Why Buy? Being a naturally aspirated engine, torque isn’t that great, at 163 pound-feet (221 Newton-meters), but it should be adequate for people looking for a no-frills sedan. The 0 to 62 mph (100 kph) task will take 8.3 seconds en route to a top speed of 112 mph (180 kph), but the car is not about performance. The Camry Hybrid aims to be one of the most fuel-efficient models in its class, sipping just 4.2 liters / 100 km on average and emitting only 98 g/km of CO2. Originally introduced last year, the newest Camry rides on the company’s Toyota New Global Architecture (TNGA) platform shared with the latest Corolla, Prius, C-HR, and RAV4. This particular version of the Camry has been tweaked to better cater European tastes and help the model maintain its top spot worldwide in the D/E-segment sedan with more than 700,000 units sold each year. 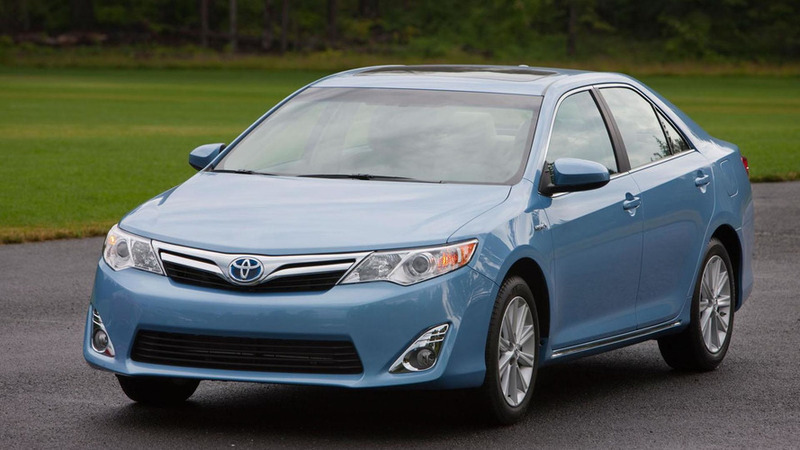 Toyota has delivered more than 19 million examples since the Camry’s launch in the late 1970s / early 1980s. There’s not much to say about styling since it mimics that of the North American model inside and out. The Camry Hybrid for Europe has a pretty decent 524-liter trunk that should prove to be enough for most families, although many of its rivals are also offered as wagons for those with more luggage to carry around during longer trips. Following its public debut this week at the Paris Motor Show, the 2019 Toyota Camry Hybrid will go on sale in Western Europe in the first quarter of next year. Making its European debut at the 2018 Paris Motor Show, the new Toyota Camry Hybrid combines stylish design and superior comfort levels with the high efficiency of its latest generation self-charging hybrid powertrain. THE CURRENT SHIFT in market focus away from diesel powertrains paves the way for the re-introduction of the Camry in Western Europe after an absence of 14 years. Strengthening Toyota’s presence in the D/E-sedan segment, the new Camry Hybrid represents a unique offer thanks to its powerful, self-charging hybrid powertrain. The new sedan expands Toyota’s European line-up of self-charging hybrid vehicles to eight models. The all-new Camry builds on all the core values that have made it so popular to date -segment-leading levels of QDR (quality, durability and reliability), quietness and ride quality- with head-turning new exterior and interior design, outstanding comfort and roominess, state-of-the-art powertrain technology and newfound levels of driving pleasure. The latest generation Camry showcases the Toyota New Global Architecture (TNGA) design and engineering philosophy. Applied to every aspect of the vehicle and its powertrain, TNGA places enthusiast-oriented ‘fun to drive’ characteristics and alluring styling on an equal footing with superlative build quality, highly efficient packaging, advanced technology and strong environmental performance. The new Camry Hybrid’s styling has a bold and distinctive appearance that seamlessly melds athletic accents and creases within the sheet metal. The front represents a bold evolution of the brand’s Under Priority and Keen Look design language -Catamaran Under Priority. A slim and deep upper grille emphasises the Toyota emblem and incorporates thin Hi-LED headlamp clusters at its extremities. The large, trapezoidal lower grille occupies almost the full width of the bumper area. 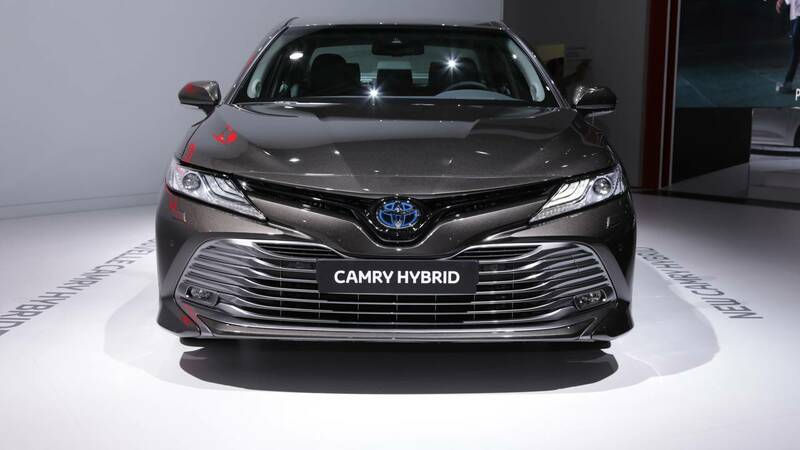 Only the bumper side corners remain, sandwiching the grille in a manner reminiscent of the twin hulls of a catamaran and emphasising the wide track and broad, purposeful stance of the new Camry Hybrid. The lower grille itself features horizontal bars which have been meticulously crafted to strengthen the visual power of the Catamaran Under Priority design and add both aggression and prestige to the wide, low frontal styling. In profile, the low bonnet and roofline combine with a low belt line to give the appearance of a cabin pulled downwards into the body, visually lowering the new Camry’s centre of gravity even further. The cabin combines an extended roofline to ensure occupant comfort with compact side glazing that fits within the wheelbase to create a uniquely stylish, sporting appearance. The rear half of the cabin tapers inwards, tucked between the broad, protruding shoulders of the rear wheel arches. Below, bumper-enveloping ‘aero’ corners flow from all-LED tail lamp clusters to further emphasise the new Camry’s wide, dynamic stance. The interior of the new Camry has been designed to offer a carefully considered fusion of function, style and craftsmanship. The sensuous curves of the new dashboard combine an ergonomically ideal, driver-focused cockpit environment with spacious, comfortable passenger accommodation. Together, the seamless component layout, painstakingly crafted textures and consistency in the use of materials create a cabin of outstanding quality and prestige. The audio system, air-conditioning control panel and 8” infotainment system screen have been fully integrated into the completely flush, piano black surface of the centre console with no gaps between the controls. The switchgear has been completely redesigned for improved functionality, appearance and tactility. All controls have been carefully shaped and ergonomically optimised, including the high-quality satin metallic switches. Seamless texture and finish quality throughout the instrument panel epitomises the Camry’s high levels of interior precision. Virtually every surface of the spacious, opulent cabin is finished in high-quality soft-touch padding, supple leather, elegant wood grain mouldings or a lustrous, newly developed satin chrome trim. A new Tiger Eye ornamentation trim is available, offering a sense of depth and shine that varies with the viewing angle in the manner of the tiger’s eye gemstone. With a choice of leather or fabric upholstery, the new Camry Hybrid interior is available in two colour schemes: Beige (leather) -which combines a dark grey carpet and upper dashboard with two shades of beige; and Black (fabric or leather) -which highlights the interior’s new satin chrome accents. In response to the enhanced levels of handling agility delivered by the new GA-K platform, the front seats have been redesigned to offer high comfort and great lateral holding ability for less fatigue. Replicating the design of the front seats, rear accommodation is available in two formats; 60:40 split foldable seats, and 40:20:40 split power reclining seats with wide headrests and a large rear seat centre armrest for enhanced comfort. The power reclining seat format is available with a capacitive touch control panel built into the front of the centre armrest, allowing for the rear seat operation of the air conditioning, audio system, and seat reclining controls. Finally, the adoption of a new rear double wishbone suspension system reduces shock absorber incursion into the loadspace of the new Camry, enabling luggage capacity of 524 litres. It incorporates an array of Toyota’s most advanced technologies including Dual VVT-i with VVT-iE (Variable Valve Timing intelligent system by Electric motor) and D-4S (Direct injection 4-stroke gasoline engine Superior version) for optimal power production, emissions performance and fuel efficiency. Key to the new Camry’s enhanced dynamic abilities and superior ride quality is its all-new, TNGA-based GA-K platform. Key ingredients to ensure an engaging drive are increased torsional rigidity, a new rear-double wishbone suspension and a significantly lowered centre of gravity. The lightweight, highly rigid bodyshell offers a substantial 30% increase in torsional rigidity over the previous model. While a newly developed, four-point engine mounting system has been designed to not only dramatically reduce engine vibration, but also further increase the Camry’s rigidity and handling stability. New suspension consisting of a MacPherson strut configuration at the front and a new double wishbone layout at the rear has been engineered to not only give superior stability and flatter cornering to inspire driver confidence, but also to deliver a premium ride quality that surpasses that of other vehicles in its class. Last but not least, the GA-K platform is designed to achieve a low centre of gravity which results in a more engaging driving position, and more precise and responsive handling with less body roll. As a result, the overall vehicle height and bonnet height have been reduced, and the cabin floor has been lowered. New Camry Hybrid is equipped with a wide range of active and passive safety features. All models come as standard with ‘Toyota Safety Sense’, a set of active safety technologies designed to help prevent or mitigate collisions across a wide range of traffic situations. Combining a camera and millimetre-wave radar for a high level of detection performance, the new Camry’s Toyota Safety Sense system features a Pre-Collision System (PCS) with a Pedestrian Detection function, Adaptive Cruise Control (ACC), Lane Departure Alert (LDA) with steering assist, Automatic High Beam (AHB) and Road Sign Assist (RSA) technology. Further driver support and safety enhancing systems include a Blind Spot Monitor (BSM) with Rear Cross Traffic Alert (RCTA), front and rear corner clearance sonar, a Back Monitor with parking guidelines, and a full suite of brake and traction control systems. The Camry’s body structure has been designed to absorb front, side and rear impacts, dispersing collision energy to help prevent deformation of the high-strength cabin area. While the use of a newly developed, ‘floating-island’ bonnet inner structure and a cowl louvre impact absorbing structure contributes to first class pedestrian protection performance.